Today's (tonight's) post is mostly eye candy. 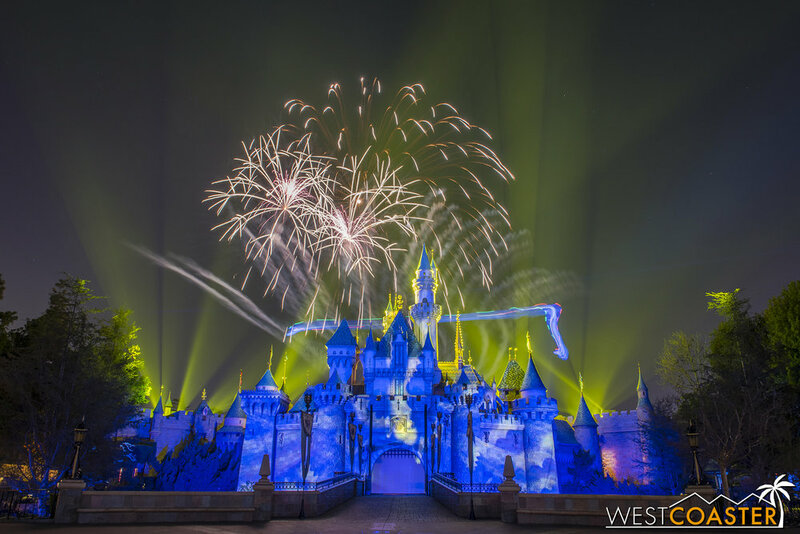 With the arrival of Pixar Fest at the Disneyland Resort comes several new or refreshed entertainment options featured at both parks. Each brings with it some unique appeal, and we're going to run through the four biggest Pixar Fest spectaculars currently running. 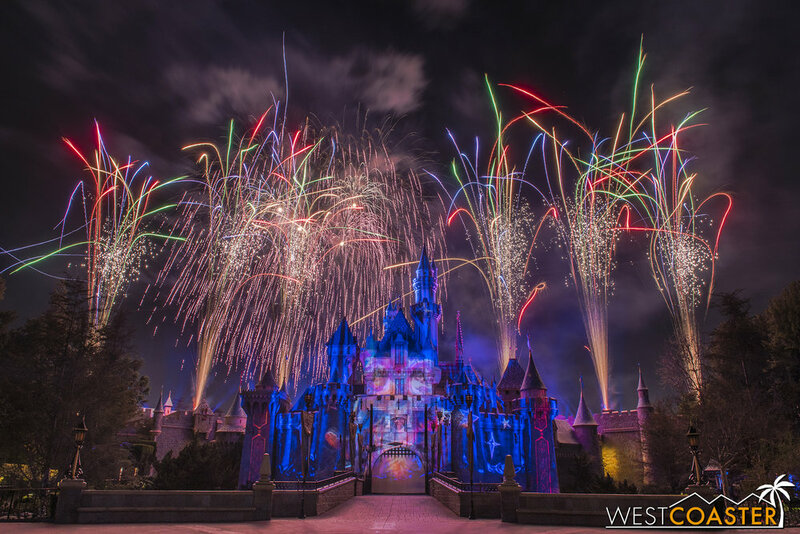 The most notable addition for the summer season is a brand new fireworks show at Disneyland Park, celebrating the special friendships and relationships that can be found throughout the Pixar films. I found it a bit surprising that Disneyland was putting forth a new fireworks show so soon after the 60th anniversary. After all, the Remember... Dreams Come True Fireworks still happens during the off-season, and that was for the 50th! Alas, Disneyland Forever only lasted a couple of years. Who knows if it will return in the future. 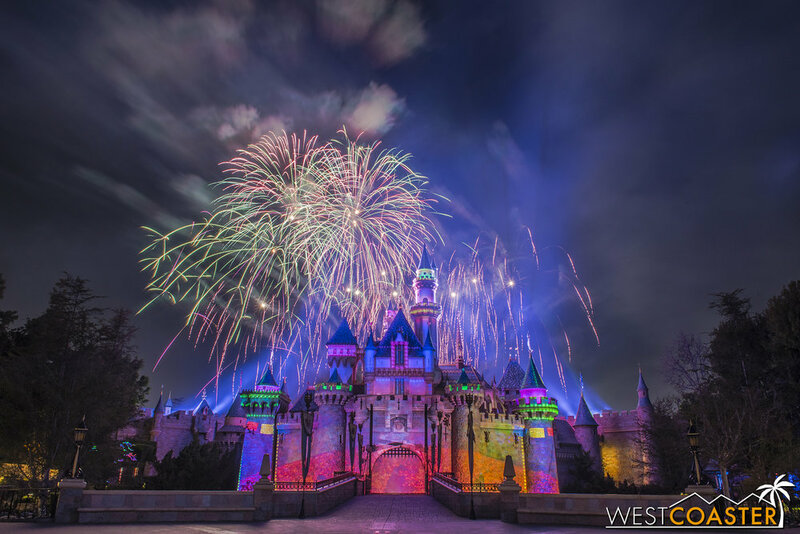 In the meantime, one would expect that if Disney is going to invest in a brand new fireworks show, which certain costs a decent chunk of change to design, program, test, and calibrate, it must be a show stopper, right? Well... unfortunately, I came away with tepid reactions to Together Forever. On its own, outside of the Disney level of scrutiny and execution, this is perfectly fine pyrotechnic show. 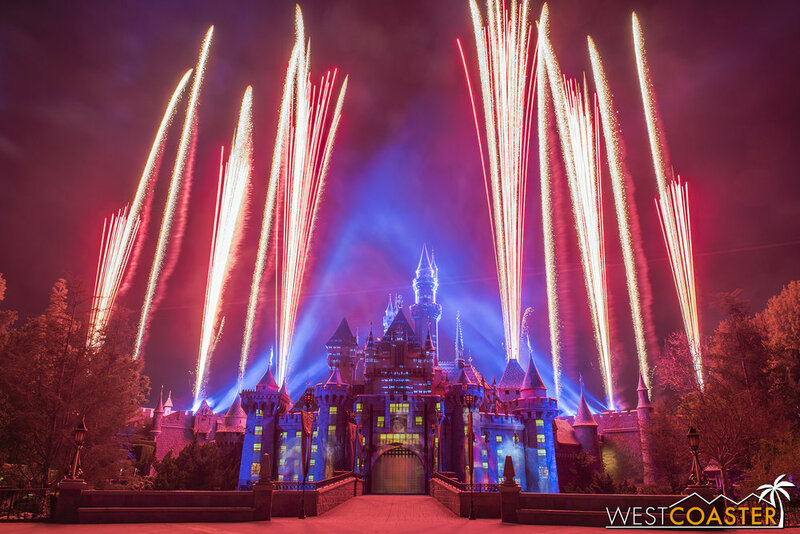 It's visually extravagant, with a plethora of actual fireworks, a ton of projections on both the castle and up and down Main Street, and a quick pace that literally keeps things booming throughout the 12 minute set. It's pretty cool when Buzz Lightyear soars across the sky over Sleeping Beauty Castle less than 30 seconds into the show (taking Tinker Bell's traditional place), and just a bit touching when the Up house does the same (similar to Dumbo in Magical from a few years back). And there are a couple of snazzy sequences, like The Incredibles and Coco, that do leave one giddy with excitement from must how fun they were. Unfortunately, for a show that is based on emotionally-laden Pixar films and uses their stirring music, the fireworks show itself is largely devoid of actual heart and emotion--at least compared to how Disneyland's modern era fireworks shows like Disneyland Forever, Remember..., and even Believe... There's Magic in the Stars. There is a lot of pizzazz, but very little actual storytelling and flow. The parts in and of themselves visual dazzle, but there is no syerngy when combined together. Each segment of Together Forever could be rearranged with any other segment in any order, and the entire show would be the same. They're all just a series of clips with pyro synchronized to music, and that's it. And while to some extent, all Disney shows are "a series of clips," the classic, memorable ones like the trio I mentioned above all carry some sort of cohesive narrative to push them to a level above any other fireworks show guests can see. Instead, Together Forever was designed as though it was a parade. "Here's a float for this movie... and then a float for another movie... and then a float for that movie." Just replace "float" with "fireworks sequence." 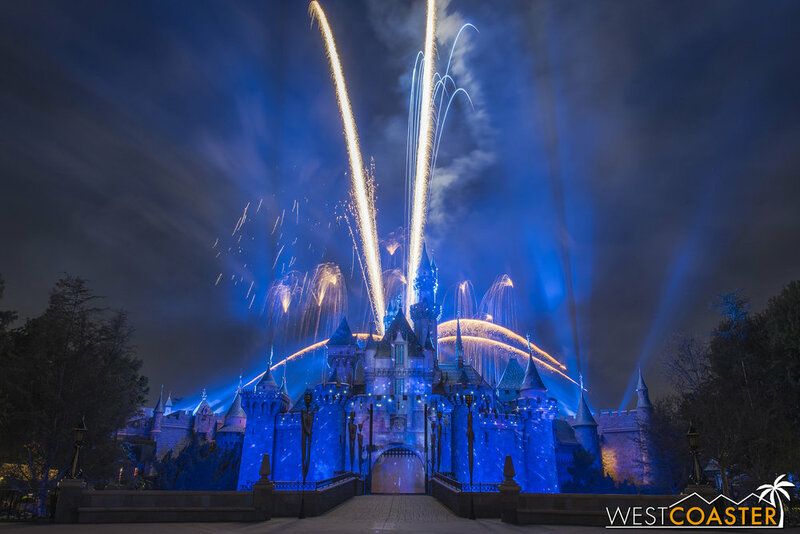 Although in both cases, guests might see some pretty fantastic production and artistry, when it comes to Disney fireworks, what really sets them apart is the added emotional resonance from the storytelling. Consider how Together Forever begins: immediately with a barrage of pyro, some famous lines from Buzz Lightyear, and a launch straight into the first segment. There's nothing to set what the show is about (other than, perhaps, the descriptive blurb on the park map). Compare that to the establishing narration by Julie Andrews in Remember, which clearly talks about celebrating the history and legacy of Disneyland Park and its famed attractions. 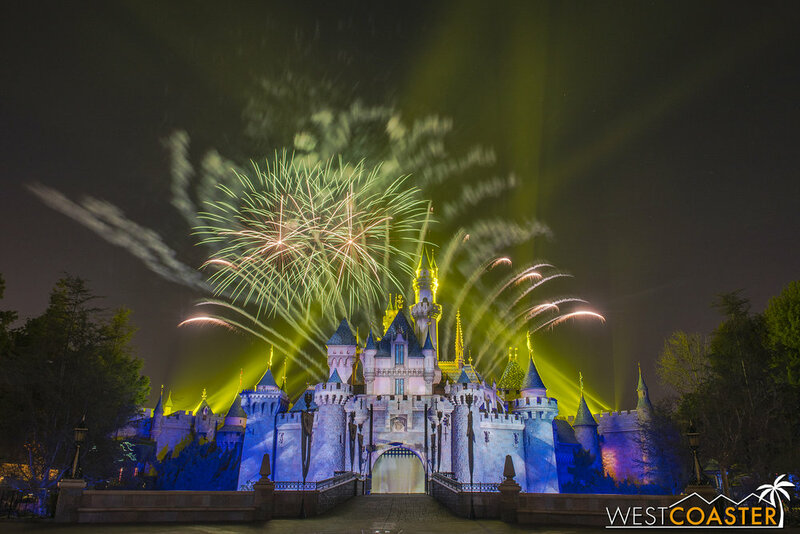 Or how Disneyland Forever has sets the tone of Walt Disney's imagination inspiring that magic of the Disney parks. You don't have to provide an overt narrator dub to tell guests what the story is about, though. The original Disney Dreams in Paris has Peter Pan's shadow run away, resulting in Peter chasing it through a series of different scenes jumping throughout various films. It's no Pulitzer, but some semblance of a story is set. And Together Forever fails to do that in its haste to get to the shiny, sparkly stuff. The new fireworks show also seems to suffer from a desire to drive sensory overload. It's a proper fireworks show--unlike the castle shows at some of the international parks. But there are projections too, which is great--when properly harnessed. 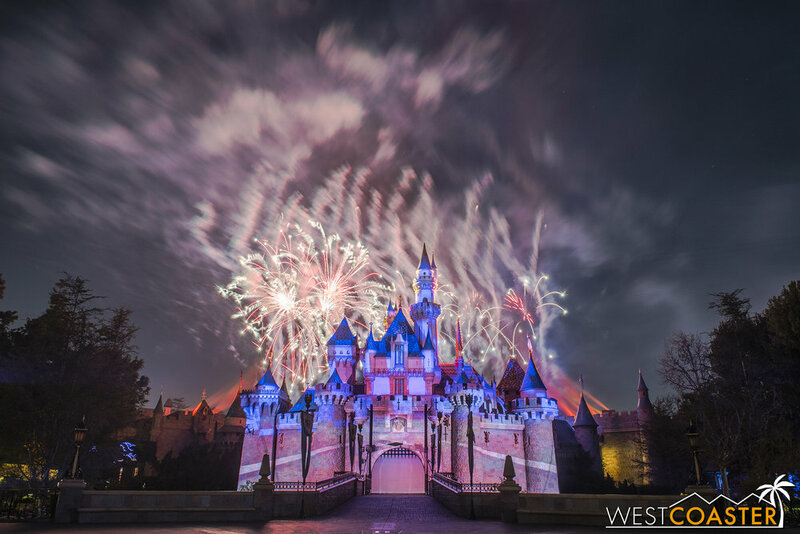 Disneyland Forever used this effectively by treating the projections more like visual texture as opposed to scenes in their own right, so they complemented the pyro. Together Forever skews more the opposite way. 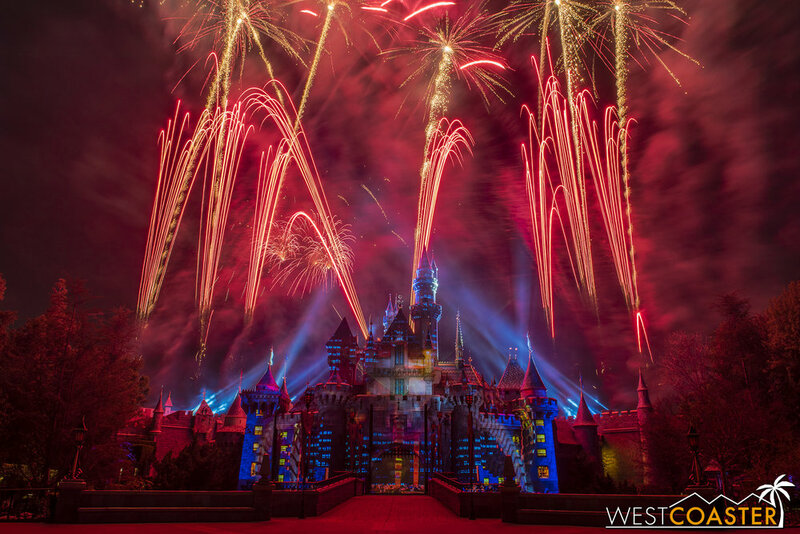 There are lots of different types of fireworks bursts, but plenty of imagery to look at on the castle and building facades too, which runs the risk of dividing the audience's attention. The lack of focus means guests aren't quite sure where to look at times, and they miss out on the base experience. This is an aspect that some poeple criticized about the new FANTASMIC!, and while I didn't feel like it was overdone there, in this show, it felt a little more attention grabbing. Most importantly, throughout the show, there is very little emotional ebb and flow. There is no journey taken through highs or lows or different themes. The tone of the show remains pretty constant from the start--and that is generally at a full throttle rate, which doesn't really give guests time to catch their breath or recover from a climactic moment and reset. When everything is at 100, it creates a lack of depth, which detracts from the show. And as I mentioned at the beginning, the sequences can occur in any order, so there's no real sense in why one movie segways to another. It feels random, and that is disappointing. Again, that's not to say that this is a bad show. Plenty of guests who watch this show will love it. It is very spectacular, and very photogenic (though also very challenging to shoot because of the back and forth drastic changes in lighting level across the different types of fireworks employed. 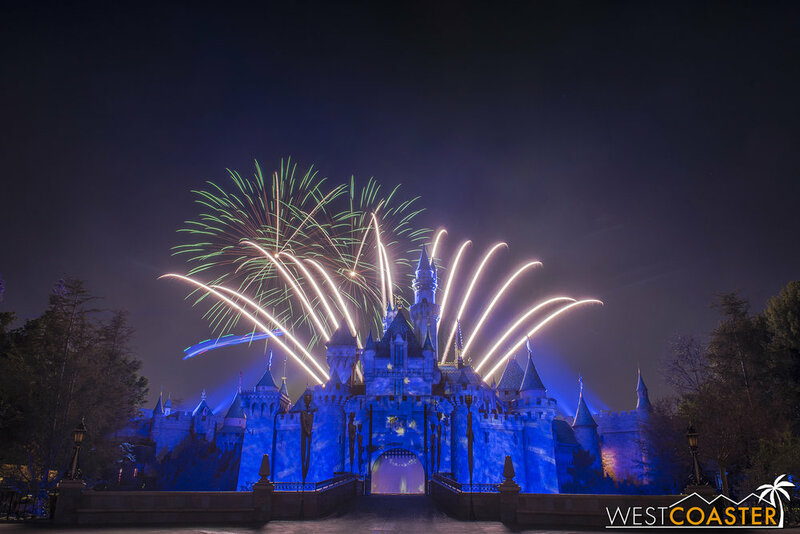 But when comparing this to most of Disneyland's recent fireworks shows (even its holiday spectaculars), Together Forever unfortunately just doesn't measure up. I'd put it at a level similar to Magical, which also has nice parts but falls short in overall synergy. It's a pop hit--people will love it, but it doesn't measure up to critical acclaim. Together Forever begins with a dramatic flourish. 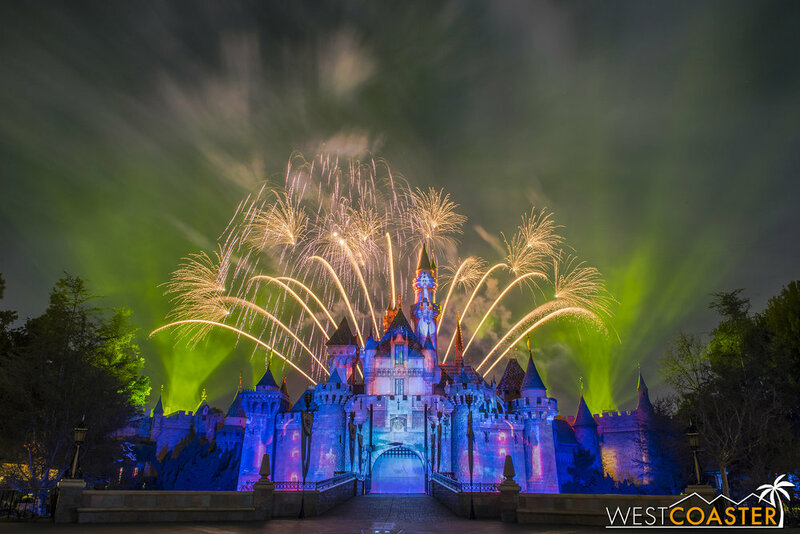 Plenty of pyrotechnics light up the sky, and Buzz Light year streaks across Sleeping Beauty Castle. And with that, the show immediately launches into its first segment, featuring Monsters, Inc. and Monsters University. A quick transition into Inside Out for a moment. Things slow down a little for Wall*E.
The “rocket” blasting off from the castle is a nice touch. It generated a great reaction just on basis of the fantastic movie itself. The segment is spirited and one of the highlights of the show. Segments like this really make it seem as though the designers thought that simply associating a part of the show with a film would generate an emotional response, without doing actual work within the show to garner said response. That might work for some audience members, but it’s really a shallow method of designing a Disney fireworks show. The Incredibles segment that follows Cars was my favorite part. It has the most variation of drama, with a mixture of comedy and sheer spectacular visuals. Also, fire is always good! Then, things switch to Toy Story 3 for some reason. It’s a sad moment in the movie, and I guess the expectation is that association will conjure up similar emotions, but there’s no real reason for the sequence. Then the Up house soars over Fantasyland, which is definitely a dramatic moment that gets people buzzing. This is a rare moment where simply alluding to a movie works, because the theme from Up is just so deeply emotional to a wide audience. Things ramp down to a happy ending. The show is supposed to be about friendships and relationship, but that’s never really evident until the end. But the pyros to cap off the show are pretty spectacular. And that’s a wrap there! During the daytime at Disneyland, the Pixar Play Parade runs twice daily, making its way from It's a Small World to Main Street mid-afternoon and back up north in the early evening. The parade is the same as its DCA iteration--so it's really the Spray Parade--with three major additions. A new opening sequence with the Pixar ball and Luxo precedes the Monsters, Inc. float. An Inside Out float has been added, with Joy and Sadness manning the helm. An Up float and series has been added, though it's suffered technical difficulty at least a few times already and hasn't always run. These aren't the best photos of the parade (and they're missing Up), but I didn't want to wait that long for better spots on the day I photographed them, so here you are. I am personally pretty 'meh' on the Pixar Play Parade. I've never really cared for it and feel it falls well short of Disney's better past parade offerings. But if you love it, head on over to Disneyland this summer to check it out! Bouncy Pixar ball kicks things off at the Pixar Play Parade. Then comes Monsters, Inc., which formerly started off the parade. It’s been revamped with a bit of Monsters U in it. Jack Jack still spurts fire from his head. Inside Out is a new addition. Then comes the Finding Nemo sequence. A Bug’s Life follows. Now with occasional fallen disembodied Heimlich! The parade still sprays, but maybe a little less than at DCA. That’s all. The Up float was not functional on this day, so I couldn’t get any photos of it. My surprise hit entertainment piece at Pixar Fest happens at the Paradise Gardens Bandstand, where multiple times a day, the Pixarmonic Orchestra performs energetic sets covering themes and songs from famous Pixar films. This group is like an occasionally jazzy big band mixed with a practical sound effects studio. Their covers feature cartoon-y chimes and bops and whistles that lend a charming amount of fun, and the enthusiasm of all the performers really shines through. This isn't even really a part of the advertising campaign for Pixar Fest this year, but I consider it a can't miss for anyone stopping by DCA. The Pixarmonic Orchestra really is quite enjoyable! The Pixarmonic Orchestra is a zany seven-piece band. They have plenty of instruments to make plenty of sound. And they belted out some great Pixar hits! Any cartoonish sound comes from here. They’re pretty awesome, so check, them out! Finally, we have the return of the beloved Disneyland 60th Anniversary instant-classic, the Paint the Night Electrical Parade! This time, though, it's at Disney California Adventure, and it features a new float dedicated to The Incredibles! Unfortunately, that float is not ready. It won't debut until June (according to what I've heard), so for now, the parade is the same as the Disneyland version, minus the Frozen float, which is too tall for the Red Car Trolley lines up and down Buena Vista Street and Hollywood Land. And for some people, that alone is enough improvement to warrant watching. For those who await The Incredibles, check back in a couple of months. But the parade is otherwise the same, and absolutely spectacular and fantastic. Here, because it's a parade, story is less of an issue or an established expectation of Disney standards. But the pure eye candy and exhilarating illumination and color--coupled with just a really catchy theme song--make this show probably the best overall Pixar Fest-centric entertainment to see across both parks. Here are a bunch of photos with a new backdrop, but familiar parade. Now! Through the DCA parade corridor. The parade starts from Paradise Pier and goes to Hollywood Land during its early evening run, then goes in reverse later at night. I prefer the direction in the latter show, in terms of photo ops. Tinker Bell leads it off still. And the old World of Color preshow giant puppets are back in their original home park again! Mike Wazowski brings up the back. Lighting McQueen is rarin’ to go. The pop lock dancers are back too. In all his spectacular, trippy, light grid glory. Also, DJ is still a thing. A break from Pixar comes in the form of The Little Mermaid. She’s joined by Nemo and Marlin, so it wasn’t a very long PIxar break after all. More Pixar with Toy Story. Belle and the princess segment follow. Cinderella and Rapunzel are right behind. And Cinderella, looking lovely as always. Mickey and friends wrap up the final segment. They’re preceded by their twirling windmill guys. Of course, who’s the leader of the club that’s made for you and me? Yup, it’s great to have the Paint the Night parade back! Hope you've enjoyed this photo journey, which was as much an excuse for me to try to take some nice photos as it was an exhibit to showcase what's going on for Pixar Fest in terms of shows and entertainment. Overall, there is a lot that most people should find enjoyable and memorable, so stop by the Disneyland Resort now through Labor Day weekend to check it out! Oh, and cheap plug, but if you liked these photos, check out my Disney photo blog that features daily posts with pictures from Disney parks both local and all around the world!